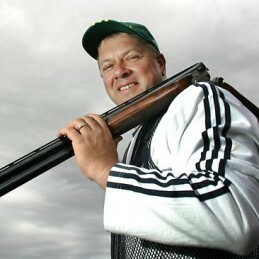 Russell Mark was one of Australia‘s four Individual Gold Medallists at the 1996 Atlanta Olympic Games, putting him in the company of Kieren Perkins, Susie O’Neill and fellow Clay Target Shooter Michael Diamond. Competing in his third Olympic Games, Russell won the Gold Medal in the Double Trap Competition. In this ultimate test of hand to eye Co-ordination, the Double Trap Competitor has .7 seconds in which to hit two Clay Targets, ten centimetres in diameter, flying away from the shooter at 100 kilometres per hour. Russell won his Gold Medal by a record six targets from his nearest rival. Russell’s career has included 34 Australian Championships, his first coming as a 16 year old Junior. With his win in Atlanta he became the first Shotgun Shooter in the history of the sport to win all four of the World’s Major Individual Title’s, The World Cup, The World Cup Final, The World Championship and The Olympic Games. Uniquely after Sydney he now has a complete set of silver medals in all four majors as well. In October 1992, competing at a tournament in Tamworth (NSW) Russell set an all time Australian Record for the most Clay Targets hit in succession without missing. Over the two day Trap Shooting Competition he hit an incredible 1,177 targets in a row. This record needless to say, has never been close to being broken. In 1996 the Sportsmen’s Association of Australia voted Russell Mark their Sportsperson of the Year. In 1997 he was honoured with the Order of Australia Medal for Services to Sport. Also in 1997, Russell backed up his Olympic victory by winning the World Championship in Peru and equalling the World Record. This made him the only Australian Gold Medallist from the Atlanta Olympics to win a World Individual Championship in the following year in any sport. Since his win in Atlanta he has been in high demand to demonstrate his Marksmanship prowess around the globe. Amongst others, Russell has coached Clay Target Shooting in the United States, Japan, England, Korea, New Zealand, Kuwait, The Philippines and even to a fellow competitor, The Prince of Brunei. Of recent times Russell has been able to show his diverse talents ranging from his media skills where he has hosted a weekly sports program on Melbourne ’s largest Radio Station, 3AW, he has worked as a commentator for Channel 9 at the 1998 Commonwealth Games and also wrote a regular column for the Olympic Club Magazine. Currently he is a regular with Red Symons on Melbourne ‘s 774 ABC Radio. He was a regular member of Channel 7’s Sportsworld program on Sunday mornings then crossed to Channel 9 to become a panel member of Mick Malloy’s “On any Given Sunday”. His administrative duties included being the Master of Ceremonies and the Australian Ambassador for the Telstra Small Business Awards, a Board member for the Fosters Sports Foundation and at the Sydney Olympics he was elected for a second four year term on the Australian Olympic Committee’s Athletes Commission. Currently Russell is on the Executive Board of the Victorian Olympic Committee. Russell’s natural talent and style for public speaking has made him one of Australia’s most sought and popular “after dinner” speakers and Master of Ceremonies. His ability to both entertain and motivate is unique compared to many of the Nation’s Sporting Icons.